Do you have your bridal shower menu planned yet? 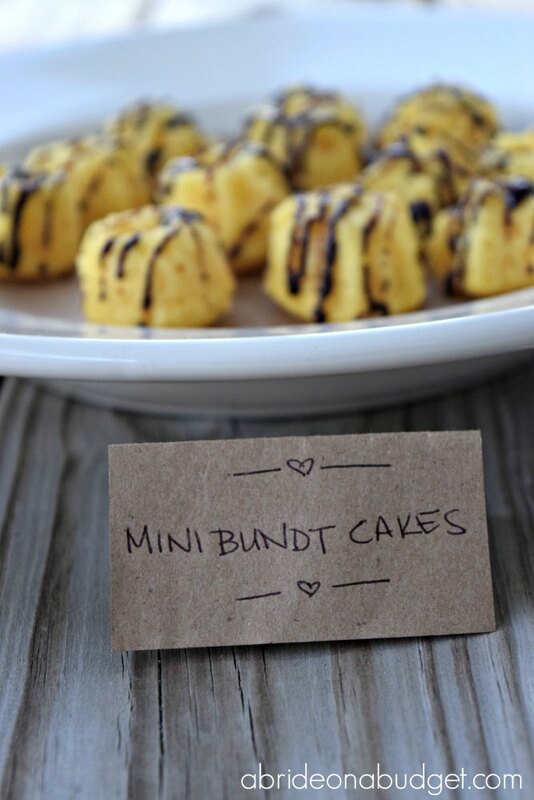 If you don't, you need to add our mini bundt cakes. They're super easy to make, taste great, and you probably have everything you need for them in your home. And, they're diet friendly. I know, I know, you don't want to think about a diet at your bridal shower. But really, a shower means your wedding is coming up. And if your wedding is on the way, you need to fit into your dress. 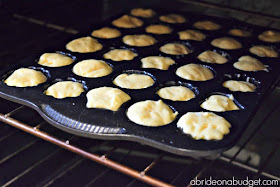 Now, I'm not exactly sure how many calories these are or anything like that, but when I make them in a mini muffin pan without frosting, they're one Weight Watchers point each. 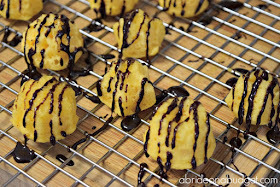 These are about half that size, but have a little chocolate drizzle. So, still diet-friendly, I just don't know how friendly. 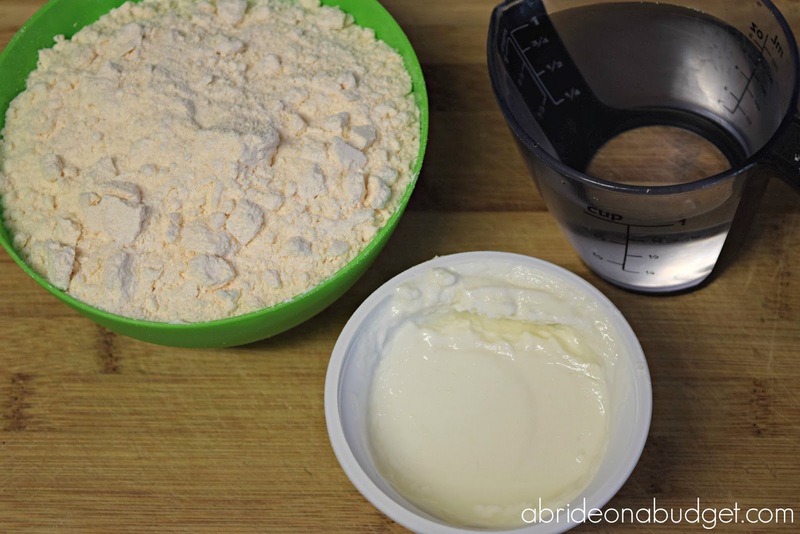 Mix together the cake mix, yogurt, and water in a large bowl. I used a butter yellow cake mix and vanilla yogurt this time. You can really mix and match any way you want. I usually stick with vanilla yogurt and I've matched it with chocolate box mix, carrot cake mix (which was our favorite), on and on. 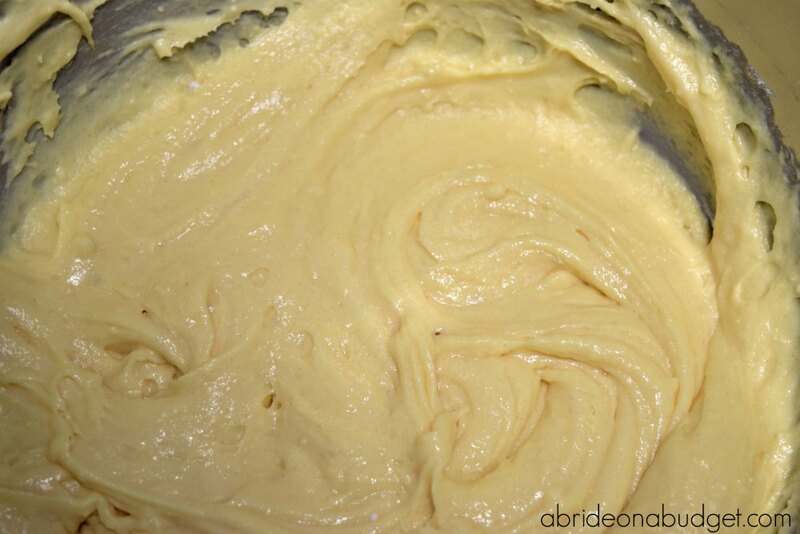 You could try something like lemon cake mix and lemon yogurt. Go crazy. Spray a mini bundt pan with cooking spray. Fill the cavities about halfway. Bake in a 350-degree oven for 12 minutes. 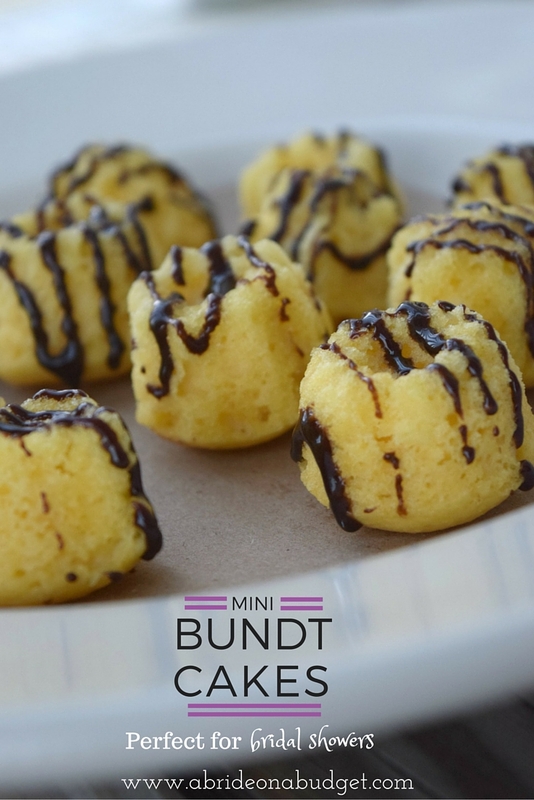 Rest the mini bundt cakes on a cooling rack until, well, until they're cool. If you go with a dense cake recipe, like a pound cake, you'll really see the details in the bundt cakes and you can probably stop here and do one of your other million wedding tasks. 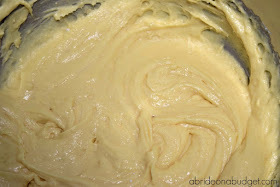 But, if you use a light and airy cake mix like the recipe above (which I highly recommend), the details aren't as great. So you need to add a little something to make them pop. That's where my drizzle came in. Now, if I'm being honest, I actually used chocolate icing for my drizzle because our home is chocolate-free right now since I gave it up for Lent. All we actually had was leftover icing from a cake I made my mom for her birthday. I wouldn't recommend icing for these, though, because it always stays just a little bit sticky. Instead, go with baking chips. 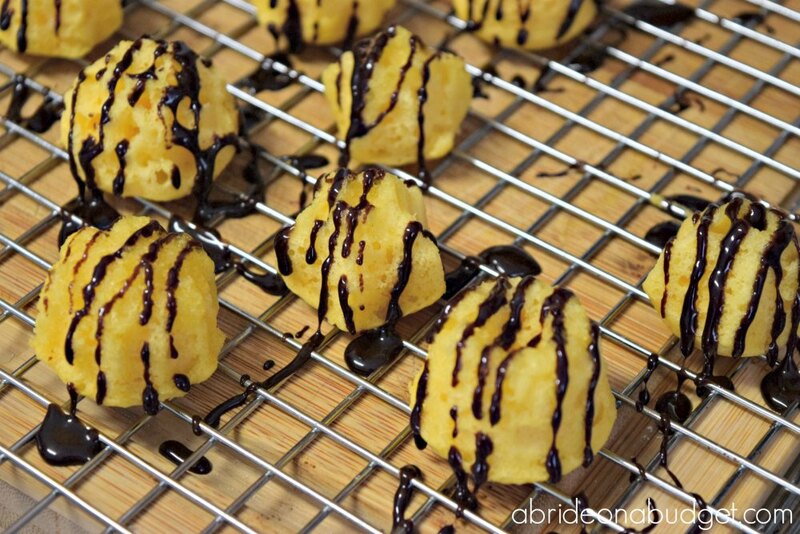 Melt them in a microwave-safe bowl and spoon it into a piping bag. If you're like me and don't own a piping bag, you can just spoon the melted chocolate into a plastic sandwich bag, then cut off the tip. Drizzle the chocolate over the top of the mini bundt cakes and wait for it to cool. While you're waiting, you can make a super cute sign that says: Mini Bundt Cakes. If you're making more than one variety, you can make a tag for each so that your guests know just what they're about to enjoy. 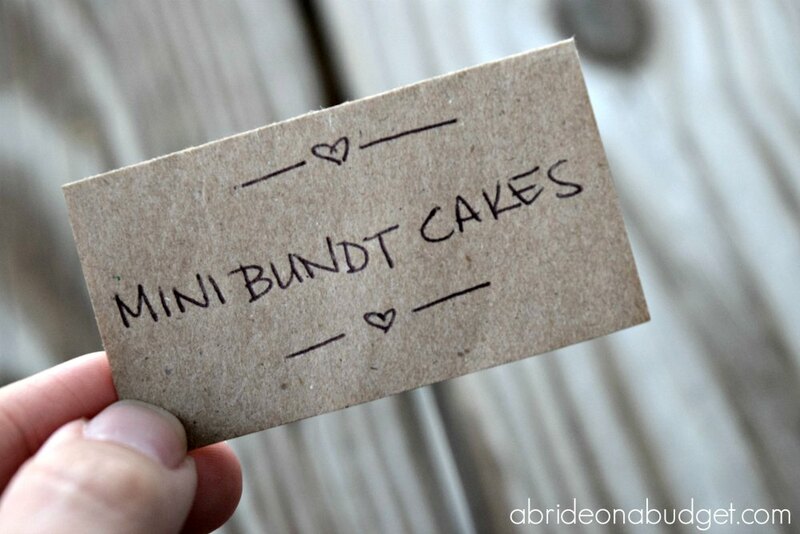 BRIDAL BABBLE: Would you make these mini bundt cakes for your bridal shower? I have never tried to make mini bundt cakes, but I think it is a terrific idea. Thanks! You should make them, if you get a chance. Mini desserts are just so fun! This is such a lovely recipe! Using Greek yogurt is a great idea! These are so cute! I think they would be PERFECT for any gathering! Thanks so much for sharing! Pinning! Very impressive to look at and I am sure they taste wonderful. Would look good on any table. Ohhh these look delish and being mini's great portion control! I also heard if you make things in mini size all the calories are zeroed out :) ha! Thanks for the yummy recipe! These sound delicious, Lisa. I love how you dressed them up with the drizzle. Great for any party! These look terrific. They would be perfect for any party. These look so good!! What a great food for bridal showers, you can't go wrong with cake and chocolate. These really are perfect for showers and they look delicious too! Ooooh...I might just have to go get one of these fun pans to add to my collection! These are so cute! The perfect size so you can have more than one dessert! LOL. Thanks for sharing at FTAF!